Front of the Class was viewed by over 12 million people. Thank you Hallmark Hall of Fame for sharing my story. The movie is based on the true story of Brad Cohen, a young man diagnosed with Tourette Syndrome who defies the odds to become a teacher. Brad is played in this Hallmark Hall of Fame presentation by Jimmy Wolk (The Spiral Project); young Brad is played by Dominic Scott Kay (Pirates of the Caribbean: At World’s End). Brad’s parents are played by Patricia Heaton (Everybody Loves Raymond) and Treat Williams (Everwood). When Brad was growing up, teachers and other adults — even his father — interpreted Brad’s involuntary sounds and sudden jerking movements as attempts to get attention or simply acting up. He was ridiculed and teased by other kids. As a result, he hated school…until a principal learned his “acting up” was a result of Tourette’s. The principal used an all-school assembly to educate the faculty and students, which helped Brad win their understanding and acceptance. That convinced Brad that he should be “the teacher he never had.” Brad had interviews with 24 schools in the Atlanta area that had teacher vacancies, but no one was willing to take a chance on him, despite an impressive college record and glowing recommendations. But he would not give up. On his 25th interview, he was offered a job as a 2nd grade teacher. 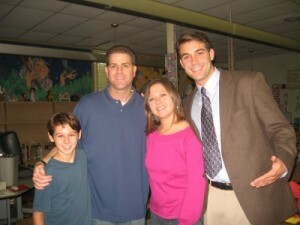 Brad’s openness about Tourette’s, his easy-going manner and gentle humor quickly won over his young students. In addition to the traditional curriculum, the students learned valuable lessons in tolerance and acceptance of differences. 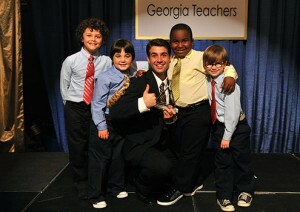 At the end of the year Brad was named the outstanding first year teacher for the state of Georgia. Brad also found his wife, Nancy, to share the rest of his life with. Pictured here on set are Dominic Scott Kay, Brad Cohen, Nancy Cohen, and Jimmy Wolk. Screenplay is by Tom Rickman, who wrote the screenplay for TUESDAYS WITH MORRIE (Winner of Humanitas Prize, Writer’s Guild Award; movie won Emmy fo Outstanding Made for Television Movie). Rickman has an Oscar nomination for COAL MINER’S DAUGHTER and 2 other Emmy nominations. He wrote the screenplay for the Hallmark Hall of Fame presentation THE HANDS OF CORMAC JOYCE. Directed by Oscar winner Peter Werner. Executive producers were Brent Shields and Tim Shriver. Producers were Andy Gottlieb and Cameron Johann. Front of the Class is being remade in India and will be released on February 23, 2018. The movie is titled Hichki and Brad’s character will be played by actress Rani Mukerji.Check out this article announcing the connection with Hichki and Front of the Class.